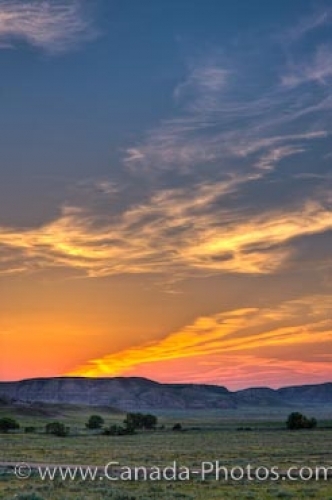 A colorful sunset highlights the farmland, cliffs and buttes in the Big Muddy Badlands in Southern Saskatchewan, Canada. The sky is aglow in colorful hues at sunset highlighting the farmland in the Big Muddy Badlands in Southern Saskatchewan, Canada. Thin, wisps of clouds float aimlessly above as the sunset lighting filters through them altering their color to yellow, pink and orange. In the backdrop, the unique land formations rise up out of the farmland as small trees scatter themselves in the foreground. A narrow, gravel road leads visitors across the Big Muddy Badlands where many people stop to watch the beautiful prairie sunsets Saskatchewan is known to have. Picture of the colorful sky at sunset over the farmland in the Big Muddy Badlands, Saskatchewan.